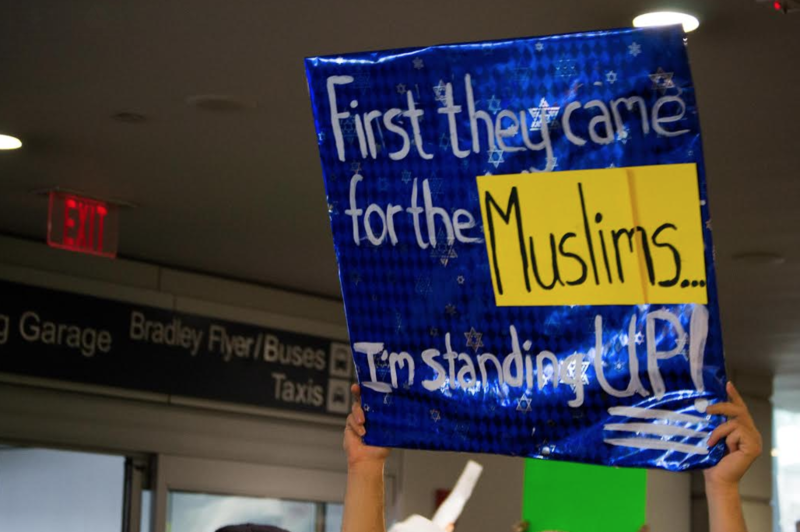 Mongi Dhaouadi, executive director of CAIR-CT (Counsel on American-Islamic Relations), addresses a crowd of over 1,000 in the Bradley International Airport terminal. c/o William Halliday, Photo Editor. From the roaring tarmac of Bradley International Airport to the momentary silence of the Wesleyan Middle Eastern Student Union in Boger Hall, President Donald J. Trump’s most recent executive order preventing all non-naturalized American citizens from seven countries to enter the United States was palpable. Those banned include people with dual citizenship in any of the seven countries (Iraq, Syria, Iran, Sudan, Libya, Somalia, and Yemen), permanent residents with green cards, and students with visas. With the University’s semester starting a day before the executive order was signed, no students are currently believed to be held from entering the United States at this time, according to Dean Mike Whaley and University Manager of Media and Public Relations Lauren Rubenstein. According to both Whaley and Rubenstein, there are eight Wesleyan students on campus from the affected countries, while no members of the Class of 2021 admitted early decision are believed to be from any of the seven countries. However, for a number of students, the executive order has already hit close to home. 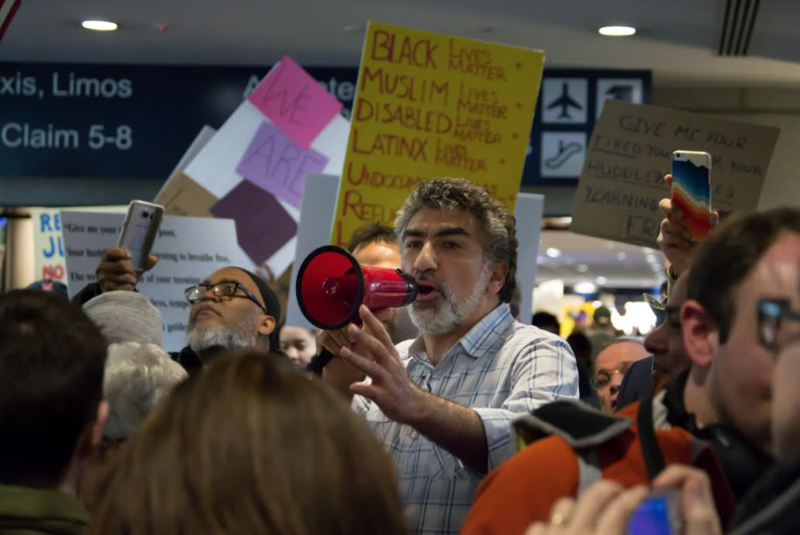 At least 1,000 protestors, including some University students, rallied at Bradley International Airport around 1:30 p.m. on Sunday to protest Trump’s ban. The Argus captured much of the proceedings on live video, with speakers including Lt. Governor Nancy Wyman and leaders of the Muslim, Jewish, and Christian faiths, such as Mongi Dhaouadi, executive director of CAIR-CT (Counsel on American-Islamic Relations). Several University students were asked to comment about their experience protesting at the terminal, but no one The Argus spoke to was willing to go on the record, with at least two attendees citing their non-Muslim white identities as a reason not to speak with the press. Meanwhile, campus Imam Sami Aziz was busy organizing on multiple fronts to protect the University’s Muslim community and local Muslims in Central CT. One of Aziz’s chief efforts has been working with CAIR to provide students with a refugee and immigration lawyer, who he will be holding a training session with on Feb. 1. 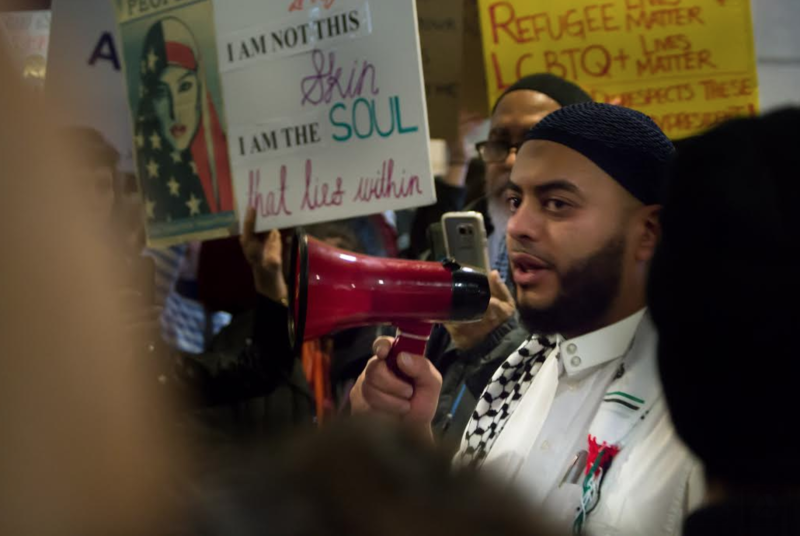 Imam Aziz also sees additional steps the University can take to help the Muslim community amid the uncertainty and anxiety they face under the Trump Administration. 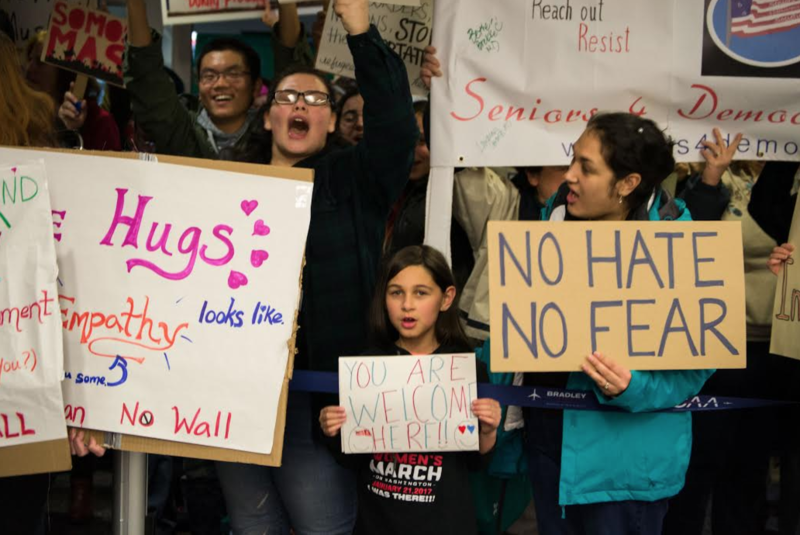 Before protests at Bradley International Airport got underway, University President Michael Roth ’78 published a blog post and sent an all-campus email indicating that the University intends to protect its students under the ban. While he conceded that the University will have to follow federal law, Roth also indicated that there will be resistance, when possible, with legal partners. Roth added that Public Safety and Admissions will not search for students’ immigration status. Some students at a Wesleyan Middle Eastern Student Union meeting that was open to the public raised concerns about the language of legal compliance in Roth’s statement, citing a lack of confidence in administrative protections under federal pressure. As the meeting went on, students suggested taking both monetary and organizational actions, such as fundraising to cover the cost of living for students who would be forced to stay on campus over the summer and writing to members of the Board of Trustees. As of the end of the meeting, the demands included assistance with housing costs for students staying over the summer due to the ban, financial aid security for international students (international students don’t receive federal funding for financial aid), keeping a list of legal help for affected students, finding out if there are students or professors currently abroad who are affected, and adding a fundraising designation for students affected by Trump’s policies. Because of the precedent set by the Patriot Act and deep uncertainty surrounding the Trump Administration’s next move, many students at the meeting with identities rendered more vulnerable under the executive order were cautious to go on the record. Others, like Ahmed Badr ’20, an Iraqi refugee with U.S. citizenship, issued a statement responding to the immigration ban. 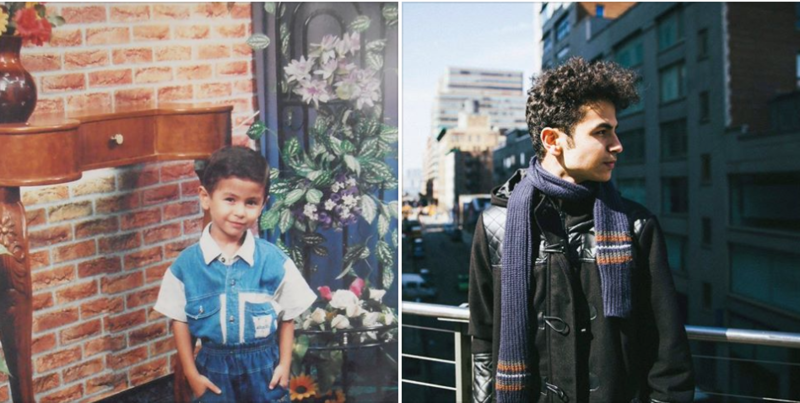 Badr followed that narrative of a second chance to underscore the importance of refugees and the misperceptions of them by those who support Trump and the ban. Despite popular depictions of the University as a monolithic far-left polis, there are indeed Trump supporters on campus, though most would not go on the record regarding the ban or their support of the former real estate mogul more broadly. Mathias Valenta ’20, however, spoke about why he supports Trump and the ban despite fears of repercussions. Valenta, who is an Austrian citizen and did not vote in the 2016 general election, gained notoriety on campus over the winter break when he posted in an admitted students group for the Class of 2020 inviting students of any political ideology to join him at CPAC (Conservative Political Action Conference), which garnered heated criticism in the comments section. Serving as the treasurer of the recently revived Wesleyan College Republicans, Valenta argued in favor of the immigration ban by pointing to what he saw as a precedent set by former President Barack Obama. Regarding the simple use of executive orders generally, Valenta is correct, but Obama’s executive order in 2011 did not ban visa applicants, nor did it establish a religious test. Publications like The Washington Post and The Economist reported that Iraqi refugee applicants were simply reexamined for six months under new vetting procedures after two Iraqis were arrested in Kentucky on federal terrorism charges. Green card holders were prevented from entering the United States over the weekend as Department of Homeland Security Officials struggled to interpret the “in the national interest” clause regarding green card holders. The list Valenta referred to was a State Department change in the U.S. visa waiver program enacted on January 21, 2016. At the Middle Eastern Student Union meeting, members like Hazem Fahmy ’17, an international student from Egypt, cautioned against relying on the criterion of violence in each country. With demonstrations and fundraising efforts planned for later in the week, Middle Eastern Student Union members felt cautiously optimistic about their efforts on campus. This story has been updated since initial publication as a developing story to include further information confirming the status of Wesleyan students from the affected countries. Trump handled this poorly but his intention is correct. Immigration is not a right it is a privilege. Every country has the right to fashion their own immigration policies as their lawmakers deem fit. As an example of this we could take a page from almost every single (and this is dozens) of Muslim nations where immigration by non-Muslims is next to impossible. But we all know this issue is not as simple as just this and that there are valid reasons to ban Muslim immigration to America and it is because Islam is profoundly unconstitutional and any practicing Muslim is, by definition, in defiance of our constitution. Islam does not believe in equal rights. Islam does not believe in man-made laws – Allah’s laws are THE law, Islam does not believe in individual rights. And, other than for vapid liberals, this is as obvious as the light of day for there is not one single Muslim country where one cannot see these unconstitutional practices in action. Better get used to federal inquiries and intrusion not just about students from the seven countries listed, but also with Roth’s blatant publicity-laced and illegal making of Wesleyan a Sanctuary campus. The Feds are coming after you Dr. Roth. I love it when foreigners protest in MY country over their right to be in MY country. I don’t promote this idea, but the US would be just fine if not one more immigrant ever came to our shores. Hey, you who are so dissatisfied in your own messed up countries that you wish to freely come here and mess up and exploit my country- no thanks! Stay home. If you want to come here and subvert my country- no thanks! If you want to come here and adopt western values and culture- let’s talk. If you want to preserve your culture yet live in harmony with mine- let’s talk. I am really surprised by the ignorance of isolationist comments like these above. Have any of you even researched the facts or looked at the statistics. According to the Heritage Foundation which is a right-leaning think tank, since 1975 there have been over 30 million people who have immigrated to the USA legally through the refugee and the asylum programs. Of that number the actual committed felonies is just 20 and the number of deaths resulting is 3. If you can crunch the #s you will see its a tiny fraction of a %. More Americans kill each other every day with gun accidents than the number of refugees who have harmed our country in 40 years. In fact, refugee and asylum seekers often become the most ardent supporters of American ideals. Just ask any number of Cuban Americans who fled Castro in the 1960s how grateful they are that our country let them in. Just ask the hundreds of thousands of Russian Jews who fled the collapsing USSR in the 1990s for the USA. Our country is built on immigrants and this includes refugees and asylum seekers. In fact the vetting process for this latter cohort of LEGAL IMMIGRANTS is among the most tedious and difficult and this fact is fully reflected in the statistical FACT that they do not commit crimes or harm our country. Rather they are a source of strength for our Republic. Shame on you for your isolationist rhetoric, our Founding Fathers would be shocked by your intolerance and dismayed by your ignorance. I’ll send an ISIS operative who blends in with the refugees to your house to finish my point for me. Thank you Wesleyan University for standing with Muslims and the oppressed. Allah bless you! Why have not Saudi Arabia or Qatar welcomed in one single Syrian refugee? And here I was thinking Islam was a religion of compassion. Silly me. Why is it Saudi Arabia does not allow one single non-Muslim citizen? I mean look at all the Animists being killed by jihadists in Southern Sudan. Shouldn’t Saudi Arabia embrace these people? Or is this a one-way street?